Suppose I wanted to invest in a fancy, money-losing carinderia–Aling Maria’s Carinderia. I can either lend it money i.e. invest in its DEBT (in which case I become a creditor), or buy its shares i.e. invest in its EQUITY (in which case I become a pro-rata owner). Hmm, ano kaya? I really want to invest in the carinderia but if I lend it money, the required interest payment will kill the already fragile cashflow. So debt looks like a no go. Besides, sa atin-atin lang ha, I DO want to influence the menu. <insert sinister contrabida music here> Gusto ko chicken inasal at inihaw na baboy lang. Araw araw! Bwahaha (kulog. kidlat)! Why dafuk else would I invest in a money-losing business? Kailan naging charity si Charles Englund?! Even if the carinderia loses money forever, I don’t care. I get my kicks in a different way. So, Equity ang sagot. Equity grants me ownership, and as an owner I would have a say in how the carinderia is run. Si Aling Maria ubos na ang capital, pero masaya lang siya basta makapagluto. Mahilig magluto yon eh. And like me, she is also an inasal lover. But, Ooops! It seems like the killjoy 1987 Philippine constitution has an ownership restriction against bloggers owning carinderias in the Philippines. 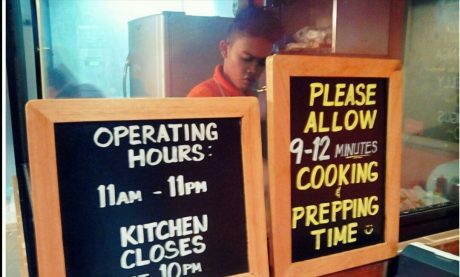 This is to prevent those nasty, evil bloggers from influencing the menu of the nation’s carinderias, thereby having undue influence over the Filipino waistline. Alam ko na! Bigay ko muna sa friend ko ang pera. My friend, Pedro (let’s call him PDR for short) is NOT a blogger so ok lang. I make a contract with PDR so that he “owns” the stock but really is bound by our wink-wink agreement to do as I say. Even if PDR grows a conscience and thwarts my evil inasal plans, I can still go to friendly Aling Maria (who knows I am the real one buttering her pan de sal). So may influence pa rin ako. Let’s go Maria. Let’s go Pedro. Heto ang pera. File niyo na sa SEC. Under industry classification be sure to put “Food and other related restaurant business”, ok? Mabuti na yung hindi nagsisinungaling, baka dyan pa tayo masabit. Follow or send me an invite on Facebook to keep updated on commentary and new blogposts. We have to advance from our “Karinderia” mentality. There are many business opportunities in our country. However, there are too many regulations and red tapes, to follow and deal with, before, anyone can have a legitimate business. There are crime syndicates, that ask for “tongs”…there is the NPA, that ask for “revolutionary” tax. There are the Police or NBI, or other law enforcement agencies, that want their share, also.. Politics in our country is business. You just fool the voters. Then, when you are in power. You can steal legally thru the ; DAP, PDAF, Pork Barrels, etc… You can even become an instant billionaire, by stealing the gold reserves of the Philippines, like Aquino, Mar Roxas, Porky Drilon, Leila de Lima, etc.. did by depositing the stolen Philippine (Marcos, /Sr.) , gold reserve loot in Thailand. Or, you can deal in illegal drugs like Shabu, with your partners, the criminals in the Bilibid Prison, and the Chinese Triad Mafia. You can become a nymphomaniac, and do your drug business, at the same time. Put your illegal earnings in different accounts in banks…business and pleasure, at the same time…Can you beat that ? Unless, we clean these Scalawags in our midst…legitimate businesses will never thrive in our country ! Cory hijacked the 1973 Constitution ( the constitution drafted by duly elected delegates in the 1971 ConCon ) and put up her own with her 50 appointed delegates to make the country the guinea pig of unbridled free enterprise economy( privatization, liberalization and deregulation) as a gift to the IMF-WB-WTO for tightening the ropes on Marcos as an aftermath of the planned return of Ninoy aka Marcial Bonifacio to be assasinated ( ala El Cid) and paraded thereafter from Santo Domingo Church to Manila Manila Memorial Park casting fear and dejavu feeling in reverse on Marcos early memories of Nalundasan mocking his father’s defeat in the congressional race for the lone district of Ilocos Norte. Cory made sure that her KKK and the new coming local oligarchs would benefit first in the unprecedented looting of government assets with her tacked in 60-40 economic provision. The looting of Marcos in his 20 years of “benevolent” dictatorship ( which Cory and her henchmen of politicians, businessmen and banks unabashedly looted in return) was just “barya-barya” in comparison to post Marcos plunder of the country’s wealth under the 1987 Constitution, the most glaring proof of which is the present US$ 65 Billion national debt with sovereign guarantee compared to the US$28 Billion foreign debt outstanding at the time Marcos was kidnapped by the Americans and brought to Hawaii. Give your typical employee a profitable corporation, and, he is mostly likely to sell it to buy a fancier suit for his next job interview.